When I worked at The Gettysburg Times as my first job out of college back in 1993-94 (and had no money), I would amuse myself at the end of a long workday by sitting at my desk and reading the dictionary. I think this explains a lot about me. Here are some words, from the letters A and B, that were new to the dictionary 70 years ago. The entries marked with an asterisk (*) represent additional definitions for existing entries. agrobiology. Noun. The study of plant nutrition and growth and crop production in relation to soil control. air-condition. Transitive verb. To equip with an apparatus for air conditioning; also, to subject to the process of air conditioning. Aryan *. Adjective. In the Nazi ideology, belonging to a supposed superior Caucasian race without admixture, esp. with no Semitic strain. baloney. Variation of BOLONEY, below. bangboard. Noun. A sidepiece mounted above the far sidepiece of a wagon, from which the ears of corn tossed by a husker rebound into the wagon. blitzkrieg. Noun. War conducted with lightninglike speed and force; specif., a violent surprise offensive by massed air forces and mechanized ground forces in close co-ordination, designed to destroy the enemy's aviation, munitions, communication lines, industry, and transport. The technique of the blitzkrieg was expounded by the Italian general Giulio Douhet and first employed effectively by the Germans against Poland (Sept., 1939). boloney. Noun. 1. Bologna sausage. 2. Something pretentious but worthless; bunk; hooey. Slang, U.S.
boysenberry. Noun. [After Rudolph Boysen, the originator.] A huge blackberrylike bramble fruit with raspberrylike flavor, developed in California from three blackberries, a variation of raspberry, and the loganberry. Bronx cheer. [From the Bronx, borough of N.Y. City.] An insulting explosive noise made with lips and tongue to express contempt; raspberry. Slang, U.S.
Ha! Just as I got ready to post this entry, I was informed that The York Emporium's Jim Lewin is also writing about dictionary entries today. Be sure to check out his blog for an exploration of Flapper magazine and “A Flappers’ Dictionary.” Great stuff. 1. Webster's College Dictionary was first published in 1898. Subsequent editions appeared in 1910, 1916, 1931, 1936 (the fifth edition), 1946, 1963, 1973, 1985, 1998 and 2003. 2. For more on food allergies, check out the excellent Food Fight blog, by Lyzz Jones. 3. 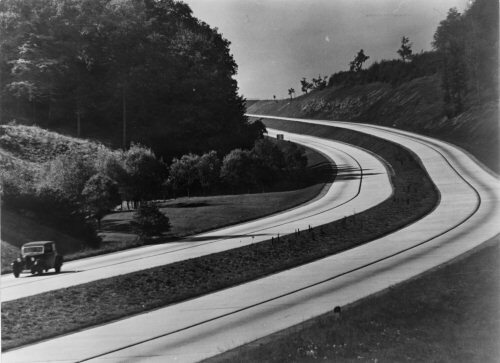 For more on the German Autobahnen, see Wikipedia. 4. Coincidentally, I have an old bingo card that I was going to blog about this week, which would have allowed me to delve into the beano-to-bingo origins of the game. But that entry never quite took flight. If you're still interested, check out Wikipedia and this excerpt from Roger Snowden's "Gambling Times Guide to Bingo."